Preheat oven to 350°F. Spray a baking sheet with non-stick spray. Place pretzels on the baking sheet and top with a Rolo candy. Bake for 2-3 minutes, or cook until the chocolate begins to turn shiny. The Rolos should be soft, but not melted. 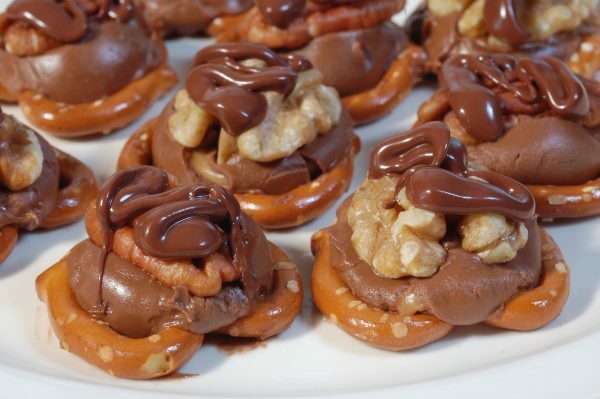 Remove from the oven and immediately press a pecan half down onto the Rolo so it flattens out across the pretzel, but not so hard that it reaches the pretzel. Let them cool, and enjoy! For an elegant finishing touch, drizzle chocolate coating over the top.